Have I told you yet how much I love Asia? It’s true – I can’t deny it. And let’s face it, instead of being a cash strapped college student traveling around Asia, I was traveling in style like never before. Surprisingly though, the more affluent visitors to China get just as down and dirty as the backpackers living in hostels. Their days in Shanghai involve back alleys and calculators! The next morning, the grandeur of our surroundings really set in when we walked down to breakfast. Unbeknownst to me, Le Royal Meridien, is famed for its Sunday brunch spread at Le Bistrot – the main dining area, which is essentially, the most glorious buffet I’ve ever been privy to. After giving our room number as entry, we were directed to a table and served coffee (with coffee pot left for refills) and set loose on the buffet. Let me see if I can recall all that there was to partake of: a fresh squeezed juice bar with at least six kinds of juice, omelet station, hot bar of Western breakfast foods like sausage, sautéed veggies, scrambled eggs, ham, hot bar of Eastern breakfast foods like congee (rice porridge), dumplings, custard buns (yum! ), hard-boiled eggs steeped in tea, fresh made pancakes, French toast and waffles, a soup station where you choose the ingredients and noodles and chefs poured hot broth over the whole thing (a common dish for breakfast in Asia), eggs Benedict, fresh-baked pastries: breads, croissants, donuts, cronuts (the trendy hybrid of a donut and croissant), fruit bar, cereal and yogurt, a salad bar (no kidding) with cold cuts, and nuts. I think that about covers it… way too much for anyone to ever do justice too – but I’m sure I wasn’t the only one giving it a good try. It turned out this was the normal morning spread at Le Meridien (I didn’t learn until the next morning – and was all the more shocked for it). That’s a level of buffet I’ve never seen before. Really impressive – to me at least – so much temptation! 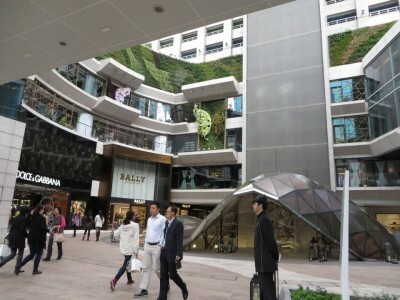 The best example of the conspicuous consumption and brand consciousness in Shanghai. 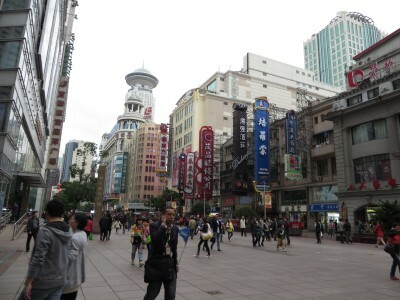 After sufficient gluttony, and prior to a final team meeting before the conference registration kicked off that afternoon, I introduced Sean to a small slice of Shanghai by way of Nanjing Rd – the biggest, most pedestrian friendly, shopping street in Shanghai. He quickly saw the level of capitalism sustainable in metropolises only like New York, London and a few other select cities, but mixed with people on the street hawking ‘copy watches’ and ‘copy bags’ if we would just follow them down a back alley. We had no need though, as a trip to Yuyuan Garden later that afternoon for just such articles was already planned. A few short hours later I was being herded along with the rest of the group through the crowded streets of Yuyuan Garden by two locals who were ‘in the know’ to tiny rooms in attics, off the main shopping streets, and down alleys that looked purely residential but actually held secret rooms full of good quality copy handbags, copy Rolexes and copy belts and sunglasses. I wasn’t especially interested in accruing more bags or watches, but just experiencing the hard bargaining, the back and forth between customer and seller (speaking two different languages no less) and the trip to the most disreputable looking places around Yuyuan was fascinating in itself! I’m glad I had the chance. 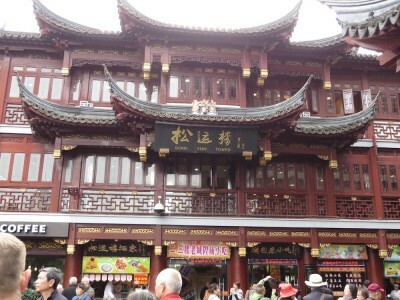 Yuyuan Garden – the ultimate tourist shopping destination. Watches, handbags, chopsticks, tea, pearls, jade and more awaits you there. When we returned, the pre-conference kicked off for any early arrivals with a reception at the bar on the 66th floor of the hotel, and the views were stunning. As well as the turnout being quite good – people from every corner of the world were there: England, Trinidad & Tobago, Germany, the US, Sweden, etc. After the reception was over, a group of us assembled to go out to dinner to a restaurant Adam remembered just a short walk away that was very good. The problem came when we arrived to find the restaurant preparing to close at 9 PM. Ok… Plan B! This turned out to be going upstairs to another restaurant that was open till 10:30 PM. Two big tables were set, menus were passed out, drink orders were taken and then the menus – complete with English translations and pictures were examined. I don’t know about you but names like “Exploding Cowboy Shrimp” and “Bacteria Pepper Fish” don’t exactly inspire confidence in my dining choices. I kid you not – it was my first re-introduction to terrible English translations in China. Thank God, we had a couple of people with our group who could read and understand the menus in their original Mandarin. With no argument, they were elected to order for the group and did so splendidly: we ended up with sautéed greens, spicy noodles, shrimp, crayfish, chicken with peppers and a good story to tell the folks back home. Everything turned out to be quite tasty, by the way. Success in my book! After our first full day in Asia, I felt a little more like I was back in my old stomping grounds, and lucky for me, Sean had one more day to explore before the conference started and I’d be left to my own devices. I decided we would really need to make the most of it since it was his first time to Asia, which meant a trip to the most famous xiao long bao shop in all of Shanghai was in order. Perfect, steaming dumplings, here we came! Pick a store, any store on Nanjing Rd. This entry was posted in Asia, China and tagged Asia, China, Fake Handbag, Knock off, Nanjing, Shanghai, Travels, Xiao long bao, Yuyuan on July 3, 2014 by Paige N..